Hobbies/Interests: Racing, RC Racing and Golf. Favorite Driver: Dale Earnhardt Jr., Dale Earnhardt. Dustin is a second generation race car driver from Delhi, NY. He began his career in 2002 in the slingshot division and never looked back. During his first year racing he got 2 wins, several top 5's and top 10's and finished 3rd in the points. From there Dustin jumped up to the modified division, first racing a small block at Afton Speedway where he got rookie of the year in 2003, and then Fonda Speedway where he got rookie of the year in 2005. Dustin also finished 3rd in the small block points that year at Fonda. Then Dustin jumped up to the big block which he ran at Fonda. In 2007 Dustin started running at Glen Ridge Motorsports Park. In just his 3rd start there Dustin got his first modified win. He has had several top 5's and top 10's in the modified division with a limited number of races. In 2010 Dustin stepped away from modified racing and started running go-karts in the KT-100 division at Dodge City Speedway. He ran there for about a year and a half and accumlated 6 wins and many top 5 finishes. Toward the end of the 2011 racing season Dustin was in store for something new. 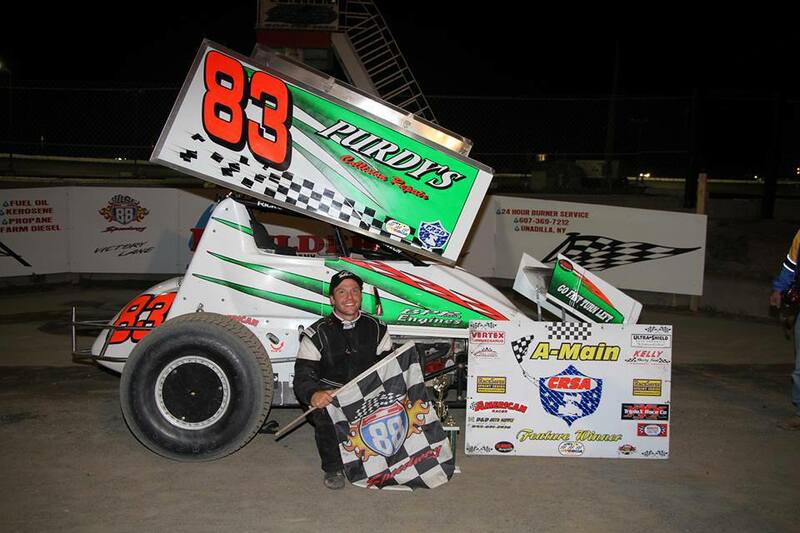 He got a chance to try a sprint car in the CRSA division and ran four features in 2011. Dustin now has two feature wins in the CRSA division with many heat race wins, and hard-charger awards. He will again be trying something new as he will be stepping up to a 360 sprint car in 2019 to run with the Empire Super Sprints and Patriot Sprints.